We look forward to having you join us on Saturday, January 25! 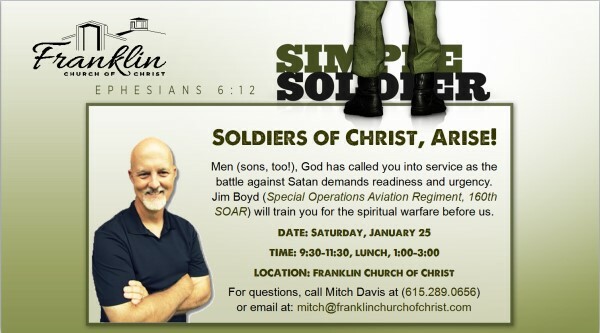 You are invited to attend a special series of interactive lectures and lessons presented by Jim Boyd, a faithful Christian who has served our country (Special Operations Aviation Regiment, 160th SOAR) and most especially, our God. It will be held at 324 Franklin Road, in Franklin, TN. We will begin at 9:30-11:30, break for lunch, and conclude with classes from 1:00-3:00 PM.